A statue commemorates Lieutenant Governor Charles Joseph La Trobe. 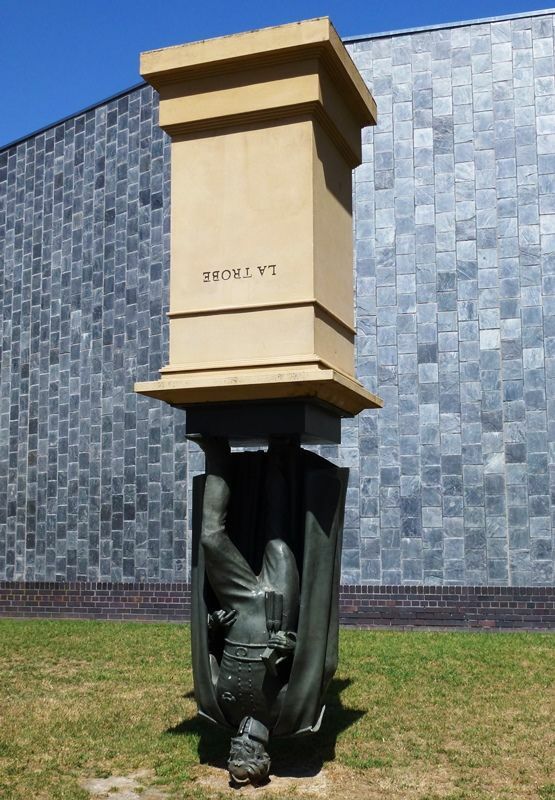 Melbourne sculptor Charles Robb turned the statue on his head, says it embodies the notion that universities should turn ideas on their heads. Charles La Trobe was the first Lieutenant - Governor of Victoria. He held office from 1839 to 1854, helping to establish the Royal Botanic Gardens, State Library, Museum of Victoria, National Gallery of Victoria and University of Melbourne. Charles Robb graduated from the Victorian College of the Arts in 1993 and completed a Bachelor of Fine Arts (Honours) Queensland University of Technology in 2002. He has held solo exhibitions featuring works from his ongoing sculptural project in Canberra, Brisbane, Perth and Melbourne. 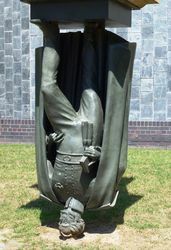 Landmark is based on traditional commemorative sculptures commonly found in public spaces, which honor heroes and those who have made significant contribitions to society. 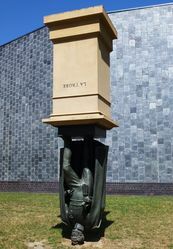 Robb seeks to challenge the merit of such monumentns in a contemporary society and a modern city by inverting this full scale statue, calling into question the relevance and authority of this predominantly European visual language. 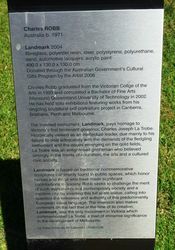 The inversion also makes comment of the fact that at the time of its creation, Landmark, was the only monument in Victoria which commemorated La Trobe, a man of immense significance in the development of Melbourne.